The coastline of this predominantly mountainous island with its countless chapels, its olive trees, its vineyards and its limpid air, is adorned with small, attractive coves. Those features combine with the crystal clear sea and the superb sandy beaches make Ios a magnet for tourists. A barren island east of Sikinos. Ios is suppose to be the burial place of Homer. 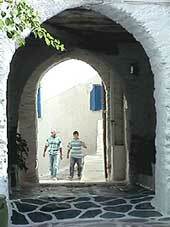 Ios is one of the most picturesque islands of Cyclades. The coastline of this predominantly mountainous island with its countless chapels, its olive trees, its vineyards and its limpid air, is adorned with small, attractive coves. Those features combine with the crystal clear sea and the superb sandy beaches. The island can get over crowded as it is loved by the young crowds especially due to its night life. 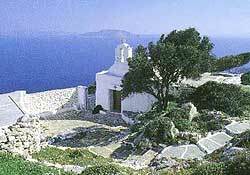 Locally called Nios, this is an island whose history goes back to prehistoric times. According to Herodotus, the "poet of poets", the "godlike" Homer was buried at Plakotos, in the north of the island. Pausanias tells us that there was an inscription at Delphi confirming the poet's interment on Ios, which was the , homeland of his mother, Clymene. Above the pretty harbour of Ormos, where fishing-boats and yachts bob at anchor, stands the capital of Ios or Hora. 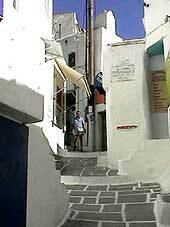 The town stands on the site of the ancient city of the same name and is a typical Cycladic settlement, with whitewashed houses, narrow alleys and chapels. Among the churches, those of St Catherine, St John the Baptist and Sts Cosmas and Damien stand out. The whole beautiful image is rounded off with the bulk of the medieval castle and the row of windmills which top the town. The sites of Ios include a Hellenistic tower and the remains of an ancient aqueduct at Agia Theodoti, traces of an ancient temple at Psathi, a ruinous Venetian castle at the spot known as Paleokastro, and the Hellenistic tower at Plakotos. Ios main harbor - Can be a bit noisy at night from the bars if this does not bother you then harbor offers a good shelter from the meltemi. The yachts can anchor on the north side of the bay . Water is limited, fuel can be obtained from mini tankers and most provisions can be found in the main town. Ormos Milopatamou - This is a large bay located south of Port Ios. There are four coves on the north side of the bay. Choose any where. This bay offers good shelter from the meltemi but open to the west and south. There are several taverns ashore. Ormos Manganari - This bay is located on the south coast of Ios. Be careful of the rocky islet on the North east side of the bay. Offers good shelter from the meltemi there are a few tavernas. Beware this is a nudist hot spot. Ormos Tris Klises - Good shelter from the meltemi but be careful of the reef on the W side of the bay as well as a shallow patch near the east cove. Lovers of the sea will he enraptured by the superb beaches of Ios, some of them busy, (such as Milopotas, near Hora), and others no less attractive but much quieter (Agia Theodoti, Psathi, Kalamas, Plakes, Tzamaria, Kolitsani and Manganari). Among the most beautiful beaches of Greece is Milopotas and Magganari. Hora and Ormos (harbor) attract most of the people at night.You can find clubs, bars and pubs. You can rent surfboards for wind surfing on the island. The Archaeological and Folkloric Museum are located in Hora, while another museum, the Museum of Modern Art (Drot- Gaiti) is at Kolitsani.